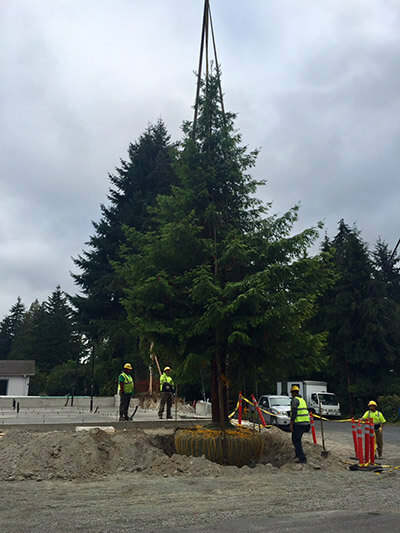 SNOHOMISH, WA: Big Trees Inc., (https://bigtreesupply.com/), a tree sales and transplant company, was contacted by a builder to move a large landscape tree on their property. The builder had been speculating on a property for some time, and in making their intentions for the property known, the city inspectors realized that this property would be losing most of its tree canopy to the renovation. The city made the suggestion to save a 25-foot tall Coastal Redwood tree as a way to mitigate some of the lost tree foliage on the property. Big Trees was asked to come by and evaluate the tree and the property for the handling of this tree. It was decided that the tree should be moved to the very southeast corner of the property from its southwest location. The tree was treated with a solution to slow and retain the hydration of the tree, and the next day, the crew of Big Trees’ transplanting team arrived to begin carefully digging, severing roots and binding the root ball together for handling the next day. The next morning, the tree was lifted and moved to its new location, set at grade of what would be the eventual finished height of soil around tree, and the tree was unbound and had topsoil added up around the root ball’s sidewalls. Drip irrigation was added to the surface of the root ball for keeping the adequate amount of water to the tree’s root system, and the builder’s project continued, with the tree in its new location.